(Lancaster, Pa., Jan. 25, 2017) - The Lancaster Barnstormers have signed three outfielders, including Major League veteran Lastings Milledge, it was announced today by manager Ross Peeples. Along with Milledge, the Barnstormers have signed speedster Darian Sandford and second baseman/outfielder Drew Doty for the 2017 season, the 13th in club history. Milledge, who will be 32 at the start of the season, was the New York Mets’ first round draft choice in June, 2003. 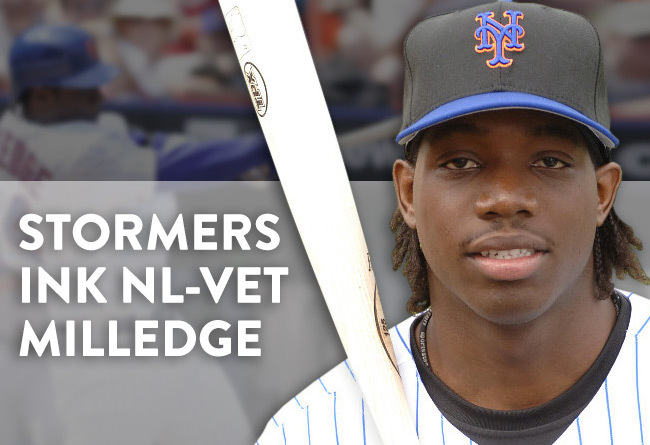 He made his Major League debut with the Mets at the age of 21 in 2006. He hit .241 with four homers and 22 RBI in 56 games his rookie season. Following two seasons in New York, the right-handed hitter was dealt to the Washington Nationals. The Bradenton, FL native had his best big league season with the Nationals in 2008, hitting .268 with 14 homers, 61 RBI and 24 stolen bases in 138 games. He was swapped with Joel Hanrahan to Pittsburgh early in the 2009 season for pitcher Sean Burnett and outfielder Nyjer Morgan. Milledge remained with the Pirates through the end of the 2010 season and played a pair of games for the Chicago White Sox in 2011. From 2012 to 2015, Milledge played for the Yakult Swallows in the Japanese Central League, hitting .300 with 21 homers and 65 RBI in the 2012 season. Sandford, 28, spent two seasons in the Kansas City Royals organization before moving to the Frontier League in 2012. Over the past five years, he has swiped 326 bases, including an incredible 99 for Vallejo in the Pacific Association in 2016. He won league larceny crowns in 2012, 2013 and last year. The Missouri native batted .293 with 30 RBI for the Vallejo Admirals last season, his seventh as a professional. He is a switch hitter. Doty, 24, is a former high school star from the Tampa, Florida area. The left-handed batter attended Santa Fe Junior College before playing for the University of Tampa his junior year.